I confess I have never been a big fan of emulation. It never felt like playing the real thing to me. However this setup really looks, feels and plays like the genuine article. 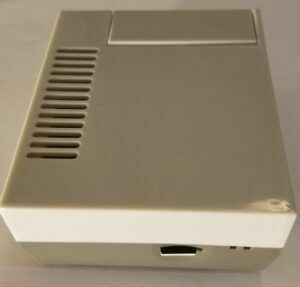 We will use a nice case, premium controllers and a Raspberry Pi board with RetroPie to create a truly authentic retro gaming experience. 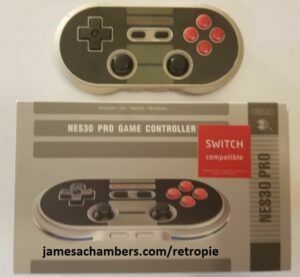 If you haven’t heard about RetroPie yet it is a Raspberry Pi distribution that supports emulation of dozens of systems such as the NES, SNES, N64, Sega Genesis and a whole bunch of other awesome retro systems. The Pi Case opened up. The two heatsinks you see come with the case. 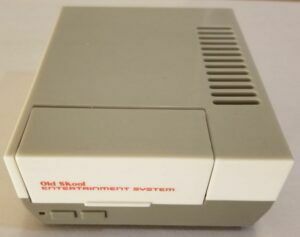 One of the biggest complaints people have had with the NES classic is that the lid doesn’t open. Well…. Our PI Classic case has an opening lid! There are many choices for controllers. The Raspberry Pi 3 has bluetooth built in so you can have a wireless controller. If you get a premium bluetooth controller you will be above $100 for your build (but not by too much). The bluetooth controllers are a little more difficult to initially configure since you need to pair them first but it is well worth it and covered extensively in the configuration guide I link to in the configuration section. 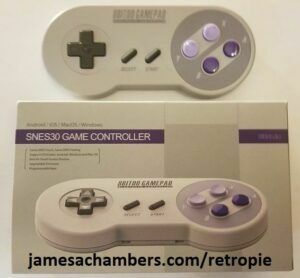 If you are on a tight budget grab the 2 pack of USB SNES controllers (they are fine for NES games too). These are the highest rated USB controllers on Amazon. Try to avoid ultra cheap controllers because many people have experienced problems with the D-Pad not performing like a genuine Nintendo controller. This can cause problems when you try to hold up and right at the same time to move diagonally as an example. The controllers I have linked all have hundreds of positive reviews and have good D-Pads that will function correctly and feel right. ROMS for the system you want to play. You will need to google/torrent these as I cannot redistribute them legally but they are VERY easy to find. Assembling the case is extremely easy. It’s 4 screws to hold the Pi in place and the case comes with 2 heatsinks you can put on the Pi 3. The heatsinks have adhesive on the bottom of them so you can stick them right on. There is easy access to your SD slot in the back of the case. Once you follow the RetroPie installation instructions below you can eject the card from your computer and stick it right in there and plug in the power cable. You will be blown away by the performance of this system. There is no lag. All sounds and music are 100% correct and authentic. It’s incredibly tiny and consumes very little power. Finally I find myself able to enjoy emulation without it feeling so fake. If anybody else sees you playing this on your TV they will absolutely believe you are playing the original NES or the NES Classic if they notice the size of the console. As long as you don’t cheap out on the controllers you will have a great experience and I highly recommend this build. This is one my favorite builds I have ever done with the Raspberry Pi and I highly recommend it! The games can all save just like traditional games. But it’s actually even a little bit better than that. You can take flash saves whenever you want (even if the game normally wouldn’t let you save somewhere). So if you’re about to fight a tough boss you can flash save and if you get destroyed you can quickly reload your flash save.